Got some leftover cooked chicken on hand? 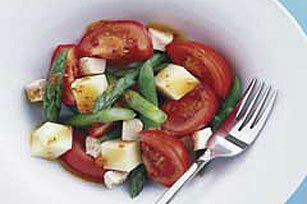 Treat yourself to this delicious (yet very simple to make) spring salad. Place asparagus spears on microwavable plate with 1/4 cup water; cover and vent. Microwave on HIGH 1 min. Spoon dressing into individual salad bowl. Top with chicken, cheese, asparagus and tomato. Toss lightly. Substitute Kraft Low-Moisture Part-Skim Mozzarella Cheese for Kraft Monterey Jack Cheese.